SAN FRANCISCO: To my complete surprise this "big truck" handles with the agility of an acrobat. Swiftly cutting across traffic lanes, I had the sensation that I was in a large sports car! 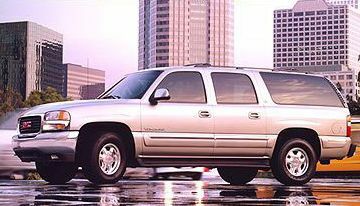 The 2001 GMC Yukon is a full-size SUV that offers a winning combination of size, power, maneuverability, and safety. I decided after the first day with my tester, if I were running a vanpool for commuters, the Yukon would most likely be my first choice. The Yukon came to me in a rich Pewter Metallic color, very handsome with muscular body contours and an authoritative stance. The grille, with the classic cherry-red logo, projects prominently and reads GMC all the way. With an overall height of 76.7" I was glad to see the handy step rail & running board. I had to laugh each time I climbed out and forgot to use it. Whoa, where's the stirrup? Inside, the Yukon is really comfortable. The two-toned look of pewter leather seats blended with gray leather on the dash, door panels and steering wheel was dressy, but tasteful. The instrument panel is fully featured, nice-looking, and easy to use. I also loved the sportiness of the sunroof. 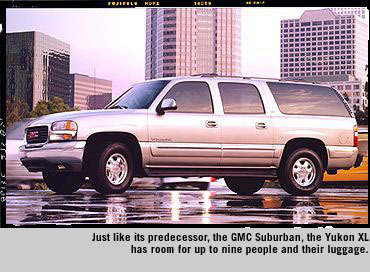 Seats, front and rear, are generously sized, and with the new third-row seat, the Yukon can claim to be a nine-seater. This would be pushing the envelope and although it could handle eight passengers somewhat comfortably, the rear third-seat access desperately needs to be improved. Rear audio and head phone jacks are now available, allowing all passengers to listen to individual music selections. (Only in America can we get such freedom of choice!) Given the overall feeling of roominess inside, I was expecting more storage bins. I was missing all the useful compartments typically found on the back of a seat, or the side of a door. The glove box was OK and there was one nice deep box in between the front seats that tripled as a storage, armrest and cup/food/Yukon Jack holder. Now for the really good stuff. In my opinion, in a truck, anything less than a V8 is a joke. The Yukon is certainly no laughing matter, but it did leave me giggling. An available option is the husky Vortec 5300 V8, which produces 285 horsepower and 325 lb ft of torque, and is mated to a smooth four-speed automatic transmission with overdrive. The power was awesome. The ride felt terribly civilized, and not at all truck-like. In city driving, the nimble Yukon zipped around corners gracefully; at 70 mph it handled well and felt secure. The Yukon's smooth-riding suspension is remarkable. Equipped with the new powertrain, this dynamo V8 can tow trailers weighing up to 8,800 pounds and pull gross combined-weight capacities up to 14,000 pounds! P.S. I'd like to know what you think. E-mail me at: coolcarol7@aol.com. Column Name: "A Benchmark vehicle in the full size class"